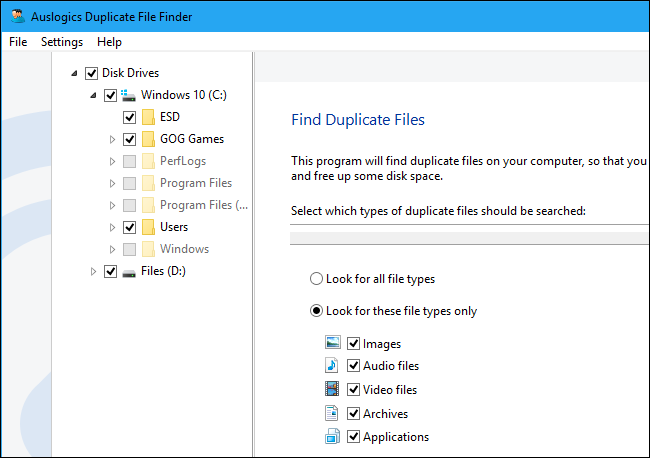 All duplicate file explorers scan your hard drive/drives to find all the duplicate files that are present in them and help you remove them which will give you some extra space to store more files. 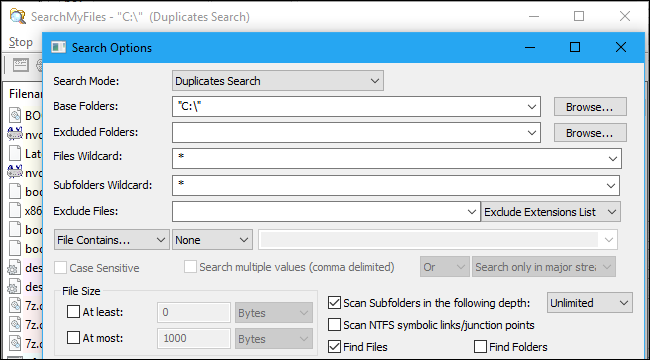 Here are some of the best duplicate file finders that we have used and that we recommend other people. These applications are easy to use. Note: Do not use a duplicate file finder in your Windows and Program Files folders. Windows and the program need those files in multiple locations that will allow it to function properly. If you want an easy application that can help you locate and delete these files then the Duplicate Cleaner Pro is the one you should have, the application has a simple interface that is user-friendly and has powerful in-app features that will allow you to delete all the duplicate files. But, this application is not free, luckily they do offer a free trial which will allow you to test the application for a couple of days. Most of the software’s or applications we download are hard to use and has a lot of options that confuse us more. But this will not happen if you download the Auslogics Duplicate File Finder, this application has a user-friendly interface. This application also has a built-in preview panel that makes the process of deleting and viewing files better, the panel allows you to watch videos, see pictures, and listen to music before you delete them. The only thing people don’t like about the Auslogics Duplicate File Finder is that it downloads additional files when the application is downloading, the installer offers a Driver Updated that you do not really need. So make sure that you uncheck any additional files to be downloaded before installing the application. The application comes with a simple wizard that will give you a walk through and show you what the application is capable of doing. It will also search all folders that are not in the Program or Windows drives, the application also allows you to select which folders or drives you want to search. Its default options will search for all duplicate audio, video, photos, applications, and archive files in your system that you may want to remove. This application also allows you to search files by typing in specific words that your file may consist. Once the application has finished its searching, it will show you a complete list of all the duplicate files that are present inside your system. One thing that is really great about this application is that it allows you to filter search, this means you can search files by its date, size, or file type. The CCleaner is a very popular application that most of us use in our computer or cellphones, so there is a high chance that you may already have this application installed in your system. The main purpose of the CCleaner is to remove all the junk files that are present inside your computer, which will give you a lot of free space once it has been deleted. It removes all temporary and unnecessary files that you don’t really need. 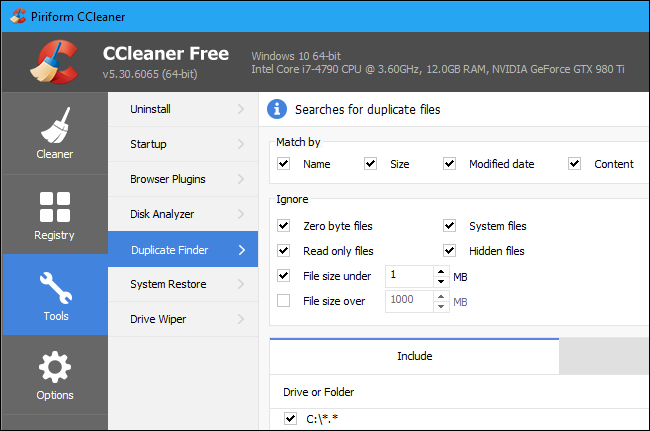 The default settings of the CCleaner makes the job easier for its user, it allows you to look at all your duplicate files in your Drive C: while ignoring all the system files that your system needs and the hidden files that are present in it. The user interface in this application is not that fancy when you compare it to the Auslogics Duplicate File Finder. But, the one thing that is really great about this is that it allows you to select which files you wish to delete from the drive and save the list of all the duplicate files into a text file. 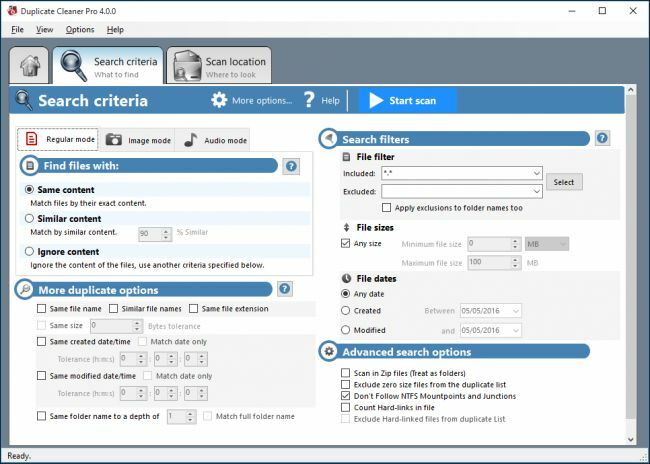 This application is a more advanced and complex one that allows you to customize your filters, SearchMyFiles can search for files that are created, accessed, or modified between dates and times your specify. This application is developed by NirSoft, a company that has created many free tools that has never contained junkware. Upon launching the application you will see a complex looking search box. The first thing you would want to do is to select “Duplicate Search” in its search mode box that you will see in the dialog, after that choose the folders you want to search in by clicking the “Browse” button that you will find in the right of the base folders. Ex. You can select the Drive C:\ so it would search all the drive C: for the duplicate files present in it. You can also configure any type of settings you want and click start search so it can find all the duplicate files that are present. This application will create a list of all the duplicate files in a group and will allow you to select the ones you want to delete.